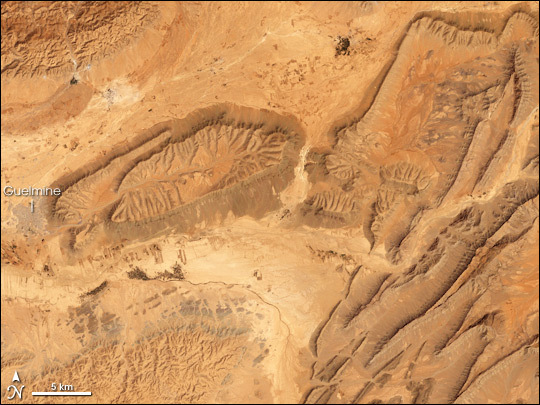 Dagger-like ridgelines and fluted-edged mesas rise out of the desert floor of southwestern Morocco. 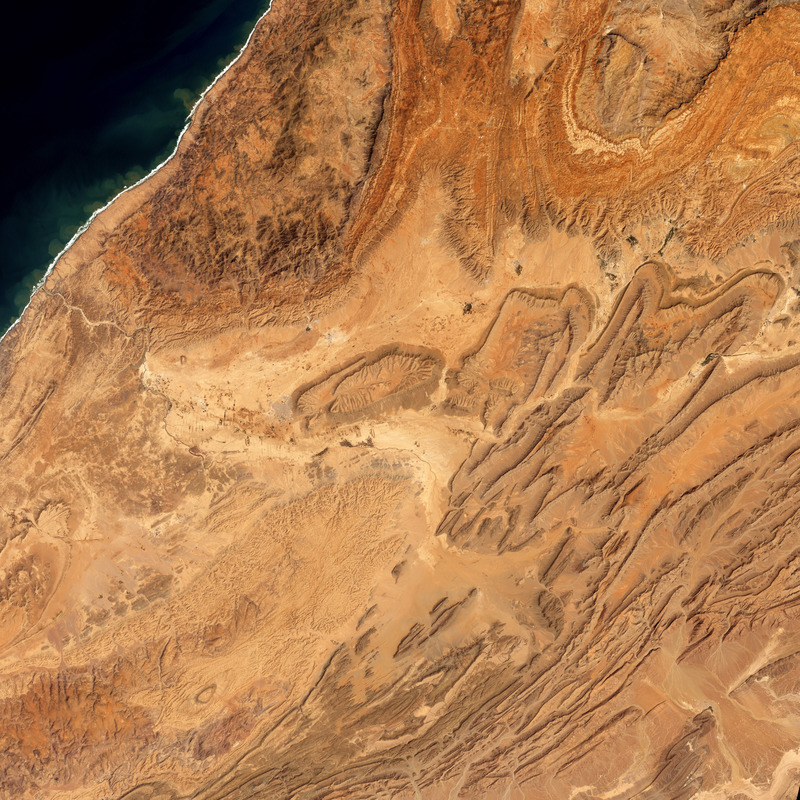 This folded, eroded landscape is at the far southwestern end of the Anti-Atlas Mountains, where they taper off at the Atlantic coast. The Anti-Atlas run northeast for several hundred kilometers, where they meet the High Atlas Mountains, closer to the Mediterranean coast of Morocco. After continental collisions built the mountains, they eroded differently based on the softness of the exposed rocks. Exposed to the relentless power of weather and water for hundreds of millions of years, the rock formations left behind are desert sculpture. This image of the area was captured on March 19, 2002, by the Enhanced Thematic Mapper Plus sensor on NASA’s Landsat 7 satellite. 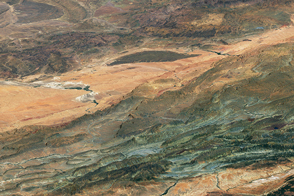 At first glance, the region, which is not far north of the Sahara Desert, seems completely barren, but careful inspection reveals several clusters of small brownish-green circles—evidence of agricultural fields being watered with center-pivot irrigation. The largest of these areas is along the river in the center-left part of the image. Though the area hardly seems like a hospitable place for a large city, in fact, the city of Guelmine, with a population of more than 95,000 people, sits just at the southwestern end of the oval-shaped mesa-like, rock formation. 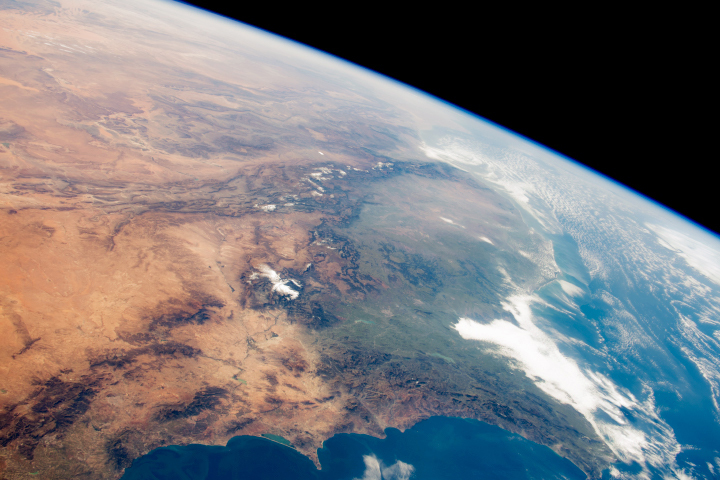 Though they are separated by an ocean, Africa’s Anti-Atlas Mountains and North America’s Appalachian Mountains are linked in time. Both appear to have gotten their start hundreds of millions of years ago, before the end of the geologic era known as the Paleozoic (roughly 540-250 million years ago.) During the Paleozoic, plate tectonics compressed all the Earth’s continents into a single massive “supercontinent” called Pangaea, which stretched from pole to pole. During the formation of Pangaea, what is now North America crashed into what is now Africa several times. As the two continents were crushed together, the Appalachians and the Anti-Atlas were built. Through the following era, the Mesozoic (roughly 250-65 million years ago), the Atlantic Ocean opened between the two continents, separating the mountains. NASA image created by Jesse Allen, Earth Observatory, using data provided by the University of Maryland’s Global Land Cover Facility. Tectonics of the Anti-Atlas of Morocco Originally published as Burkhard, M., Caritg, S., Helg, U., Robert-Charrue, C., and Soulaimani, A., (2006). Tectonics of the Anti-Atlas of Morocco. Comptes Rendus Geosciences, 338 (1-2), 11-24.